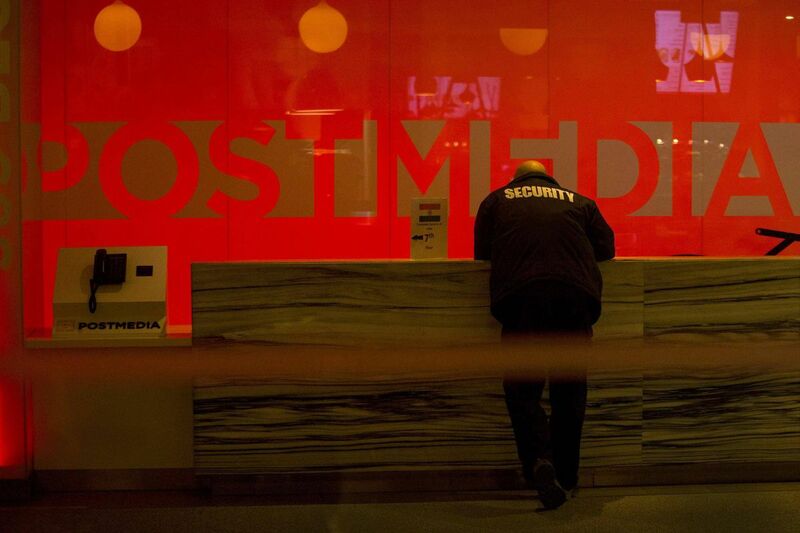 A security guard stands by the reception desk at Postmedia’s Toronto headquarters on March 12, 2018. The Competition Bureau's search of offices of Torstar Corp. and Postmedia Network Canada Corp. continued on Thursday, as investigators visited the Torstar-owned Hamilton Spectator. In a memo, employees at the newspaper were cautioned not to tamper with any electronic or written files related to the investigation. Last November, Torstar and Postmedia struck a deal to swap 41 newspapers – most of which were subsequently shut down. "It is important that no one disrupt or interfere with the investigators' work," publisher Neil Oliver said in the e-mail, which was obtained by The Globe and Mail. The newspaper closures have allowed surviving Torstar and Postmedia papers in parts of Ontario to operate with less competition, causing the federal watchdog to launch a probe. One of those areas is the Niagara region, not far from Hamilton, where small publications such as the Fort Erie Times and Niagara Advance were closed after Postmedia traded them to Torstar. The bureau has not concluded any wrongdoing and no charges have been laid. If the bureau determines that something was offside in the deal, the next steps could include seeking penalties, such as fines or jail time. But it's unlikely to restore competition in the affected markets. Under the merger provisions of the Competition Act, if a deal is found to "result in a substantial lessening or prevention of competition in any market in Canada," the bureau can apply for an order from the Competition Tribunal to dissolve or change the merger – for example, by unwinding the deal or requiring companies to sell off assets to a competitor. It can also negotiate with the companies to find a "remedy." In this case, a remedy may be difficult to achieve since many of those assets no longer exist: The two companies shut down all but five of the papers they had just exchanged, arguing that the slide in print advertising had rendered most of the papers not viable. "There don't seem to be any meaningful remedies," said Robert Jackson, who worked as an investigator with the bureau and its predecessors for nearly 30 years, and is now retired. "It puzzles me that the commissioner even went forward under the merger provisions. … What will the result be?" The bureau is reviewing the deal not just under the merger provisions of the act, but also the conspiracy provisions, which can lead to penalties in the form of fines up to $25-million, or up to 14 years imprisonment. That can act as a deterrent to such actions in the future, but is not a remedy as such. Asked why the bureau decided to proceed with a review under the merger provisions – since it seems few remedies are available – spokesperson Jayme Albert responded by e-mail that he could not address specifics of a review because of confidentiality. He noted that the bureau prefers to resolve such situations by negotiating a remedy with the merging parties. Each of the two avenues of inquiry requires the bureau to prove different things. Under the merger provisions, the bureau must first establish what the market is – both in terms of product competition and geographic area. In this case, it raises a question of how to define competition in an industry that is undergoing a major transition from print business models to digital ones. With print advertising in decline, publications are focused on making the move to selling digital ads and subscriptions – an online market with plenty of competition. The merger provisions of the act also allow companies to adopt "failing firm" defence, if the assets in the merger have failed or are likely to. They can also defend themselves if they can prove a merger creates efficiencies that "outweigh and offset its likely anti-competitive effects." "I think in a merger case, they would probably mount a fairly strong efficiencies defence," said Chris Hersh, a partner in the Competition, Antitrust & Foreign Investment Group at Cassels Brock & Blackwell LLP in Toronto. Under the conspiracy provisions of the Competition Act, however, such defences are not relevant. These provisions include a prohibition against "market allocation," or an agreement between competitors not to compete in certain geographic areas, as well as agreements to fix prices or to restrict supply of a product. That case does not require the same analysis of the market as the merger provisions, Mr. Jackson said, because such agreements are considered "per se unlawful." "These types of competitor agreements are believed to be so obviously harmful to competition that proof of their actual [competitive] effects is not necessary," he said. In response to questions from The Globe and Mail, the companies both reiterated on Wednesday that they are co-operating with the bureau's investigation and do not believe they have contravened the act. Such investigations typically take a significant amount of time because of the scope of information that must be analyzed. Mr. Jackson questioned the wisdom of pursuing both avenues in this case. "Suppose that the bureau, at the conclusion of its inquiry, decides that the transaction would not result in a substantial lessening of competition. Would that not undermine the bureau's case under the conspiracy provisions, since the presumption of harm that is at the heart of the new conspiracy provisions would be thrown into question?" he said. "The commissioner's contradictory conclusion might then become fodder for the defence at any subsequent trial for conspiracy." Whatever the outcome, the bureau's review seems unlikely to bring back local newspapers that have already shut their doors. "Even if the commissioner believes and can prove a merger is anti-competitive … I don't know how feasible it would be to say, you've got to recreate the papers," Mr. Hersh said. "At the end of the day, it's hard to think of a solution that would actually restore competition."